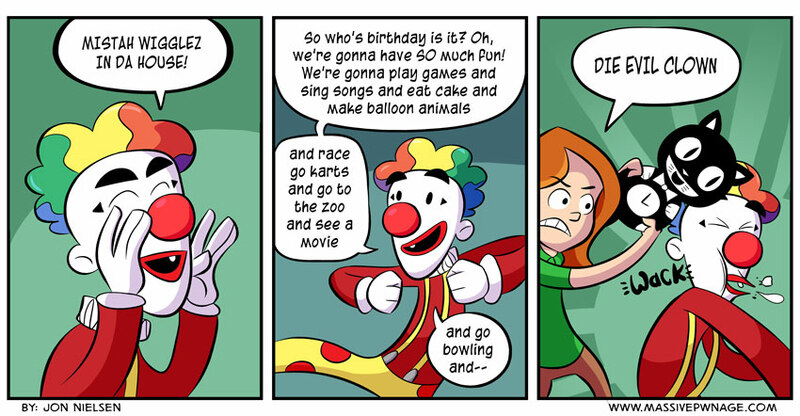 A perfectly rational response to any and all kinds of clown situation. Did you guys see the new Star Trek? SPOILERS: I totally nailed it. This entry was posted on Wednesday, May 22nd, 2013 at 12:00 am and is filed under Comics. You can follow any responses to this entry through the RSS 2.0 feed. Both comments and pings are currently closed. Indeed you did lol. Forgot all about that comic. It was a good movie, even though its the first Star Trek movie I’ve ever seen. I hear I’m missing out on a lot. I’m going to see that tomorrow. And I already rememberred the strip, luckily, so it’s not too bad a spoiler. Heck, I keep hearing about it. Anywho, here’s hoping that Locke is let out of the clock. Also I like how the clock is a centerpiece.